While on a recent flight I was reading Success magazine and came across an article that got me thinking…..how do you really become a great leader. Some people are just born with leadership qualities and others really have to work at it. But there is something that all leaders have the ability to do…. 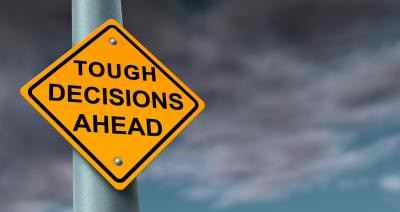 As a leader, boss, or manager there are always those decisions that aren’t going to be the popular choice but they have to be made. If you have the mentality that you have to be everyone’s best friend you aren’t going to be the best leader to drive everyone forward. So many people get hung up on worrying about what people will think about them and not wanting to be the “bad guy” and wanting to be everyone’s friend. As you become more successful, and your business grows the harder the decisions become and that’s where most people just stop making the tough calls because they don’t want the pressure of making those decisions. I have had to make a lot of really big decisions lately, not everyone likes the choices right now but I know they are the right moves to ensure the long-term visions. Since the start of this year I have only been at my home in Florida for about 20 days total. I don’t want to be constantly traveling, but it’s what I have to do right now. I didn’t want to buy into a company to turn around and step in as the CEO, but I knew I was the best person for the job. Not speaking as much was a really hard choice, but it has to be done in order for the company to grow beyond JT Foxx. I know I’m not the most popular person in any of my companies, but at the end of the day the people who I work with and that are part of my team know that I am making the best decisions to keep all of the companies growing and moving forward. When I set out on this journey I didn’t set out to be the most popular person, that’s not the legacy I want to leave. My legacy is to be the person who helped a million people make their vision a reality. If you aren’t someone who is good at making decisions, that doesn’t mean all hope is lost, here are some tips for you to get better. Depending on the decisions this could be a ten-minute process, or might take a day. But don’t keep delaying tough decisions because you don’t want to make them. One of the toughest decisions is when it comes to your team. These are the people that you work with every day, but if they don’t follow policies and aren’t adding benefit to the business it can’t be about who your friends are. At the end of the day you have to make the right decisions for you and your business. Just remember, to be confident and take action, no one is going to follow anyone who doesn’t take action! The funny thing is here, I was never the one to belief in myself, I was that person that thought success stories happens to other people. Other people find greatness, other people know for sure what they are doing…..not me. All I knew was to work hard and earn money to take care of myself. Even when all my life a burning passion was following me, I ignored the possibility and just carried on doing what I was doing. Lucky for me others did not think the same about me. People see me as a leader, they respect me and they believe i will only do great things. Destiny caught up to me and am now in the position where i stopped doing everything that was not going to match the passion and get me to fulfill my potential and here i am with no sustainable qualifications but Life has been the best university i could of asked for. Am not sure if this letter is going to get to you, am sure you receive so many, but it feels good to write this to you, because i know you will get it.